If travelling in the height of Summer, book an early morning or late evening gondola ride to avoid the heat. 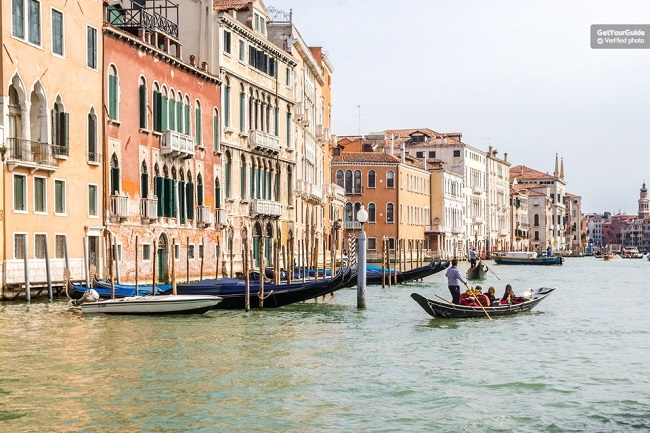 We are comparing Venice Gondola Ride and Serenade Prices from leading ticket suppliers and Try to find you Cheap tickets prices on the market. Venice – the world\'s most romantic city - is well known and loved for its traditional gondola\'s and there\'s no better way to experience a romantic trip on the canals than by taking a ride in one complete with live music thanks to a local singer and accordion player. At its peak, Venice had more than 10,000 gondolas floating along its canals but today only approximately 500 gondola\'s remain. One of those iconic once-in-a-lifetime experiences that first-time visitors to Venice should experience and enjoy. The best option if you cannot afford a private gondola ride. Not recommended for the budget traveller due to the short amount of time spent on the water and the small portion of the waterways that you cover. Avoid this gondola ride if you dislike tourist gimmicks! Not ideally suited to honeymooners and couples due to being placed on the boat with other travellers. Your Experience With Venice Gondola Ride and Serenade? Make your way to the pre-designated gondola pier at your chosen date and time and take a seat in a traditional Venetian gondola. Together with up to 8-10 other gondola\'s (each boat seating 6 passengers maximum), you\'ll make your way along a portion of the Grand Canal also exploring the picturesque narrow waterways, your traditionally dressed gondolier doing all the hard work. All you have to do is sit back and enjoy the experience as the sights of Venice pass you by and listen to singer/accordion player serenading your group with his traditional music. You\'ll pass by some of Venice\'s unique architecture that can only be admired from the Grand Canal including Palazzo Barberino. In the narrow waterways the serenade really takes effect, the dulcet melodies amplified by the buildings on either side. Snap some photos and take some video but more importantly, stay present, and enjoy this once-in-a-lifetime experience, it will be over before you know it. What Venice Gondola Ride and Serenade Includes? 30 minute traditional gondola ride on the Grand Canal and smaller waterways. A traditionally dressed gondolier will guide your boat along the canals. A a singer/accordion player will serenade passengers with traditional Italian/Venetian songs. Journey on the Grand Canal and the picturesque back waterways. If you\'re hoping to slip an arm around your partner as you travel down the Grand Canal, be sure to sit in the front or back of the gondola – On some boats, if you sit in the middle you will be opposite each other not next to each other. Try and book a late evening ride so that you can witness sunset on the Grand Canal. Travelers Reviews about Venice Gondola Ride and Serenade? Travellers talking about this gondola ride on Get Your Guide, Viator, Ticketbar, and Trip Advisor give it very good reviews and say it\'s worth the money for the overall experience. Everyone agrees that it\'s an unforgettable experience but wish they had longer than 30 minutes to enjoy the ride! Some travellers had hoped to see more iconic sights but due to the short amount of time this wasn\'t possible, they still enjoyed the experience for what it was though and would do the trip again. Not accessible for wheelchair users or people with serious mobility problems. Arrive at the meeting point 10 minutes before the scheduled time – Allow extra time to navigate the winding streets of Venice!